Great storytelling; ultimately memorable and one of a kind; originally written as a diary and not for publication, this book makes the inland passage to Alaska and its islands known and discoverable again. This is a wonderful book that lovers of boating, the BC coast, or just good stories will thoroughly appreciate. Great story of a mother who travels with her three children and dog in a boat through the northwest waters. Great adventures. Nonfiction. Put a mother, five children, and a dog in a twenty-five foot motorboat to cruise the British Columbia coastline for four summer months before having to return home before onslaught of the bad weather in fall. They got to know some of the homesteaders that lived in the various inlets, explored First Nations winter villages, searched for a seahorse one of the children was sure they saw, had close calls with bears, and visited the inlet where Henry the Orca had gotten stuck in because he hadn't listened to his mother. Of course, there were also the times when they were sheltering in a cove off Mistaken Island and Capi was working the fore and aft anchors to keep the Caprice with just enough water under her keel to keep her from grounding or up an Lewis Channel when the engine died and Capi had to tow the boat with the dingy five miles to so she could anchor Caprice before working on the engine. A beautifully observed memoir of years spent boating in the Pacific Northwest. The style is that of another era, but the author's celebration of wondrous places is timeless. If you boat in the Gulf Islands, Desolation Sound, or the Broughton Archipelago, you must read this book. I was lucky enough to have grown up on Vancouver Island and had parents that took me and my siblings on many picnics, hikes and camping trips giving us all a love and curiosity about nature and this corner of the world. 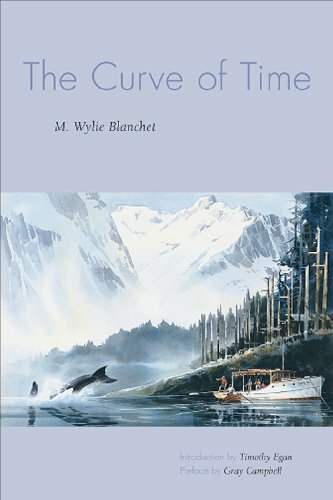 The Curve of Time by M. Wylie Blanchet is a memoir written by a widow, who with her four children spent the summers of the 1920’s on a 25 foot boat, exploring the coastal waters of the Pacific Northwest. Acting as both “captain” and mother, she and her children enjoyed their summers of freedom. Although there were dangers from bad weather, rough water and wild animals there were also great rewards. They met some interesting people who chose to live away from the rest of mankind but were happy to act as hosts to this small family, they were also helped and guided by the commercial fishermen and the loggers who were working in the areas that they travelled. They spent their summers discovering beautiful beaches, secret coves, and deserted Indian villages. This type of vacation travel was unusual to say the least and the fact that she was a women caused many people to sit up and take notice.